Barkerville, British Columbia. Wells, British Columbia. Part of the BC Adventure Network. Over a million web site visitors annually! Travel in the steps on the Cariboo Gold Rush miners on the Cariboo Wagon Road to the reconstructed historic town of Barkerville and the nearby bustling town of Wells. Barkerville is located at the end of the Gold Rush Trail, 89 km (55 mi.) east of Quesnel on Highway 26. In 1862, Billy Barker found gold on Williams Creek, a discovery that started a rush of fortune seekers from all over the world. Between 1862 and 1870, over 10,000 people travelled the Cariboo Wagon Road, named the eighth wonder of the world, converging on the gold fields, and the boom-town called Barkerville. 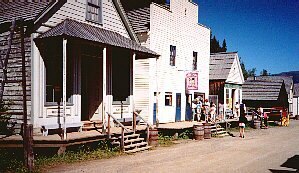 In its heyday, Barkerville was the largest city west of Chicago and north of San Francisco. Along the highway to Barkerville, where stage coaches and pack horses once travelled, there are historical points of interest with such intriguing names as Mexican Hill, Robber's Roost and Devil's Canyon. Cottonwood House Historic Site feature one of the last original roadhouses along the Cariboo Wagon Road. Blessing's Grave is a lonely roadstop marking the site of an infamous murder. This authentically reconstructed historic city of Barkerville is one of the finest anywhere, boasting over 100 displays and "living history" programs; roar to the antics of the stage shows at the Theatre Royal, sample a treat at the bakery, quaff a glass of cool root beer at the saloon, or partake of pioneer (or modern) fare at one of the eateries or hotels along Main Street. Stop and talk to the "residents" and find out what it was like to be a blacksmith, a school teacher, seamstress or young child 100 years ago! To bring home your experiences get a photo taken in top hat or long gown and billowing hat. 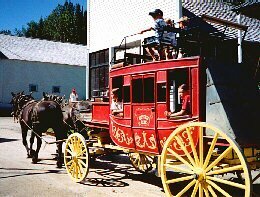 Barkerville - Barkerville Provincial Park offers the visitor a chance to step back in time; attend the historic St. Saviors Church, schoolhouse lessons, courthouse trials, stagecoach rides, Theatre Royal, blacksmith demonstrations, photographer's studio. Canoeing Bowron Lakes, hiking trails, cross country skiing, snowmobiling, photography, wildlife viewing, bird watching, mountain biking, dog sleding and back country skiing. Wells provides motels, a hotel and bed and breakfasts accommodations and there are three provincial campgrounds within 2 km of Barkerville. There are eateries for your dining pleasure. B.C. Parks, 540 Borland St. 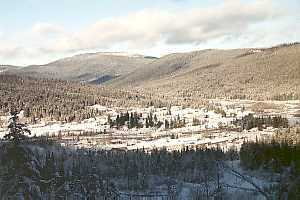 Established in the 1930's as a gold mining town, Wells is located 82 km (51 mi.) 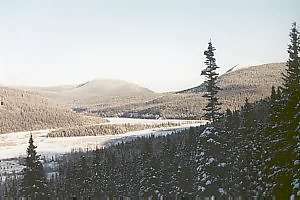 east of Quesnel on Highway 26 and 8 km (5 mi.) west of Barkerville. The town is named after Fred Wells who had prospected in the area for 10 years and discovered the Cariboo Gold Quartz Mine. Wells' mine introduced a new era in the history of gold-mining in the Cariboo since there had been little lode mining up to that point in time. The town reached its maximum population of 3000 by 1940. The population is now substantially reduced but swells in the summer with the influx of summer residents and those coming for the various activities in the area or to partake in the courses offered by the Island Mountain School of Arts. The school features workshops in folk art, the performing arts, photography and journalism, drawing and watercolour. The gallery is open to to the public, with special sales and shows through out the year. Wells has four gallery/gift shops that are linked by a footpath. Winter and snow conditions in the Wells Barkerville make for excellent snowmobiling, cross country skiing, back country skiing and dog sleding. Every spring the town hosts the Great Canadian Hill Climb, a very difficult course, with snowmobilers from all over Western Canada participating, or just watching the spills and trills. Summer in Wells and area means mountain biking, hiking, canoeing the Bowron Lake canoe circuit, fishing, gold panning, wildlife viewing and bird watching. Barkerville, which is near. offers a walk back in history, a glimpse of yesterday. Wells is presently restoring some of the historical buildings to bring back the character of the town. The Wells Hotel - Enjoy the simple elegance of one of British Columbia�s newly renovated heritage country inns. Offering cozy accommodation and wonderful country meals! White Cap Motor Inn & RV Park - Located in south Wells, we are open year-round. Trails for hiking, mountain biking, snowmobiling & skiing lead right from the front doors. Spacious accommodations and RV sites. Close to Barkerville & Bowron Lake and outdoor recreational activities.